I can't claim fame for this fun card, it was a make and take from Joanne at Mainly Flowers, all of the components and instructions were added into a Stampin Up order from her to make up. You can see from this photo that the Robin was made with a circle punch the redbreast is another punched circle punched again to remove part of the circle, the wing and beak is the petal of a pointed flower and a google eye to finish. Legs are hand drawn. this is one sweet design...the birds are a delight! Isn't that a cute card. 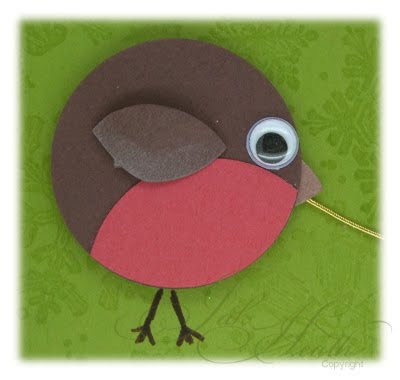 I am a huge fan of Joanne's, i too have done that design and it's very easy to make the Robins. These little birds are a delight Jak! HI I BOUGHT THE DIGI STAMPS ABOUT TEN DAYS AGO HOW DO I GET THE DOWNLOAD I PAID BY PAYPAL AND HAVE NEVER HEARD ANYTHING? Made me smile first thing this morning. Thanks. Wow what a great idea. I love the robins they are so cute. They look easy to do too. Cute, cute, cute, Jak - great card.